Reviewed 03/14/2015 by Matt B.
I have Carried this knife for over 3 years now maybe 4 and I absolutely love this knife. This is in my pocket everyday no matter what and never leave home with out it. It has saved me in a lot of situations with just simple things. The tip is just a little weak in strength but I am also using it as not intended nut it gets the job done. I plan on buying another at some point as a back up! I bought this knife last week for under $135. I fondled it months ago at Cabelas and was unimpressed, it was not until I received my own unit that I learned to appreciate this knife. The knife has a deep cary pocket clip, weighs next to nothing, and packs a value-punch at $130. I was surprised to find it so cheap from a major retailer, since many others have it for $45 more. Its biggest flaws are its ergos, the handle doesn't fit my hand well. That being said, this knife has not left my pocket and I absolutely love it. A very small knife, I wish it was a tad bigger as it feels like a child's knife. The Damascus blade and micarta inlay is really just for show, but, I have a feeling I may buy another one. This knife is sure to please with it's axis assist and ambidextrous clip mountability. Of course, at benchmades MSRP of $500, it would not be worth it. If you can get the GC one for less than $350 you'll be happy. This knife is well worth the money. I have carried a number of different knives, hands down the light weight and quick opening speed make this an amazing choice for anyone in the market. I am one of Benchmades biggest fans BUT this one really disappointed me, it's a great pocket knife however the finish on the scales just rubs off TOO easily and for a $200.00 knife it's such a let down. Benchmade makes great knives but they just can't get the finish to stick to there aluminum scales for some reason, very sad indeed...!!! 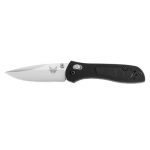 I think it's about time that a women gives her opinion on a knife (we are 50% of the market place you know), the only thing that I would say Benchmade did wrong with this knife was it's name, they should have been called "The Lady Finger" (he he). The knife was a birthday gift from my husband and he did extremely well when he choose it for me, I love the cut away section on the handle so as not to brake a nail when I flick it open. I adore the size for my petite hands and the way it can simply slip into a handbags side pocket with a deep clip and I know exactly where it is if I need it in a hurry (right next to my pepper spray). My goodness I do love the way the clip also hides the knife away in the pocket of my jeans and its so slim it's almost unnoticeable, this is just a perfect knife for a lady. I like the way the lock is on the side to secure it so I feel safe when the knife is in my handbag or pocket, I don't want to have any issues with it opening accidentally as I rummage though my bag or put my hand in my pocket for my keys. Well where do I start, I suspect that the right place to start is with praise to Benchmade for creating an engineering marvel with the new 470. It is without question one of the most ergonomically friendly knives that I have ever purchased and owned and makes for the perfect Gentleman or Ladies Knife..!!! The knife really only has two drawbacks, firstly is the $200.00 price tag and even at what the market is really paying for them (we all know how the game is paid, sorry PLAYED..LOL). In my opinion it's really is a little steep compared to it's competitors, even it's wonderful features the price seems to over exceed the perceived value of the knife (However if money in these hard times is not a problem to you then, I suppose it not an issue). The real dark horse to this otherwise wonderful knife is the coating, the stark reality is that it just won't stand up to use with scratching and rubbing being it's true Achilles Heel and this is an issue that any one buying it should take into serious consideration before investing in one. 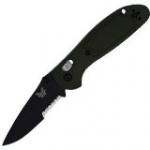 The 470 Emissary folding knife is one of the new 2011 models from the Benchmade Knife Company. It is thoughtfully designed, feature rich and exceptionally well-engineered. 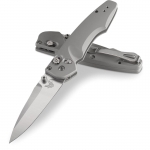 The 3" clip-point blade is an Osborne design, with thumb studs on each side and made from S30V premium stainless Steel. The handle is a CNC billet Aluminum Alloy with a thickness of 0.45" making this an extremely low profile, thin and lightweight knife. The 470 uses an Axis locking mechanism with a secondary back-up lock which can be enabled in both open and closed positions. Visibly, one of the most stand-out aspects of the 470 is the very functional and ergonomic contoured handles which are perfectly positioned to align either thumb to initiate the Assisted Open. I was happy to find the Emissary design absolutely flawless and the S30V steel definitely lives up to its reputation. Just got this knife in the mail today. Awesome look and feel. Very light. Snaps open with minimal force on thumb stud. No flipper. Blade is great and lists my knife as 167/1000 first production. Very good feel in the hand. Aluminum handles have dull appearance which I like and will hopefully not scratch very easily. This knife is a bit pricey for this class ( I paid 149 shipped ) since you can get Kershaw models like the Leek and Scallion for about 20-40% the cost of this one. The weight is quite a bit less than the Leek so probably not a fair comparison. My only concern is if I am really willing to use this as my daily carry or if the cost and rarity will cause me to worry about damage or loss.